Anxiety is usually an unspecified sense of unease. You may be anxious about losing control of yourself or a situation or there may be a sense that something bad is going to occur and you cannot do anything about it. Anxiety effects the entire person, it is psychological, physiological and behavioural. Physiologically anxiety causes physical reactions in one’s body including but not exclusively, rapid heartbeat, muscle tension, excessive sweating, shallow breathing, dry mouth, stomach ache or nausea, butterflies in the stomach. Psychological anxiety may result in a sense of detachment from ones surrounding or even in extreme cases a feeling as if one were dying or losing one’s grip on reality. Other times it may lead to behaviors which attempt to alleviate the distress of anxiety. Often this is confusing and can have an adverse effect on mood.However, anxiety, although uncomfortable when it is being experienced, can be relieved. 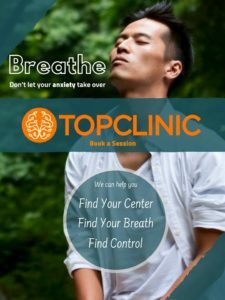 There is plenty of evidence to show that Cognitive Behavioral and Emotion Focussed Therapies can effectively treat generalized anxiety. EFT focuses on helping you tolerate, regulate, reflect on and express your feelings in the safety of the therapy session. This way you may transform these physiological responses as they arise day-to-day. Qualitative data captured by Timulak et al. (2017) and O’Brien et. al (2017) demonstrates that individuals who engage in Emotion Focussed therapy for anxiety report changes in emotional functioning, emotional-avoidance patterns, worry, self-acceptance, low-mood, somatic symptoms, apprehension, self-confidence, and self-understanding and over-compliance tendencies. CBT is a form of therapy which focuses on raising our awareness of current behaviours and thinking patterns, and how these form part of a system which effects our experience of emotion in the world. We can change behaviours and thoughts, making it possible to shift feelings and experience of life. Multiple studies find CBT delivered online and effective treatment for anxiety including a 2007 meta-analysis by Spek et. al. and a randomized controlled trial in 2011 by Praxling et al. If you would like to look at your anxiety together, you may contact us using our booking form.